Most people see waxing strictly as part of a female beauty routine, but men are getting in on the act too. Men are increasingly using wax to get rid of unwanted body hair (apart from on the face). This article offers advice and tips on waxing as a form of hair removal for men. 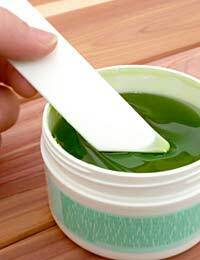 Waxing involves removing excess or unwanted body hair using strips of hot wax. It sounds painful, and it usually is! Hot wax is spread onto the required areas and stripped off using cloth. This enables the hair to be removed at the roots, which means that waxing generally needs to take place less often than shaving. With delicate procedures like waxing, it's best to get it done professionally. If the hairs aren't pulled out at the root, you can end up with ingrowing hairs, which could get infected. This is especially advisable if you intend to have any delicate areas waxed, or want to have hair removed from large areas (such as the back or chest). Waxing is not recommended for getting rid of hair on your eyebrows, face and genital areas (believe it or not, this is a growing trend! ), as these are too delicate. If you still want to do it yourself at home, here are some tips for making waxing safe and as painless as possible! Although the wax needs to be heated, it doesn't need to be boiling hot, as this can burn your skin. Don't use the stove to heat it, as it is flammable and can easily catch fire. Apply a bit of the wax to a small area to test it. The last thing that you want is to have an allergic reaction over a large area of your body! If you don't have any reaction to the wax, you should be fine to carry on waxing. The wax should be applied in thin, even strips. Make sure that the strips are as close as possible, but not touching one another or overlap. When it's time to remove the wax strips, pull them off in the opposite direction to which the hair grows. If your skin is broken, inflamed, irritated, sunburnt or cut, don't wax it, as it can lead to an infection or make your skin even more sore. This also applies if you have warts or moles on the skin. Waxing is not advisable if you suffer from diabetes or problems with your circulation, as there is also a good chance of infection. Once you have finished waxing, applying a cold compress (such as ice wrapped in a thin tea towel) can further prevent any risk of infection. If the thought of going to a beauty salon to be waxed doesn't appeal to you, you can pay a trained beautician to do the waxing in your own home, but you will probably have to pay extra for this. Many men will consider this to be well worth the money if it spares them the potential humiliation of being seen in a beauty salon though!